“Croft’s company trains dogs for personal protection, as well as for drug and explosives-detection. Most of the dogs they train are for the military, but Croft says 20 to 30 per month are trained for personal protection for clients all over the country. “I personally would rather have a dog than a gun. A dog never sleeps,” Croft said. Families who buy the trained dogs go through handlers’ courses to learn how to control the animal. There are other good reasons why a dog is a better self-defence tool then a gun. I personally would rather face a novice gun owner then a guard dog. 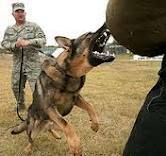 Dogs pre-empt, rather then just react to a threat. And to top it off, dogs are legal to own and keep. The only problem is, with the demand in guard dog increasing, i fear what kind of operators will get into the guard dog training business and what kind of shady characters will purchase guard dogs.